Welcome to Older Womens Cohousing Group. Building a community for over fifties women in a purpose built location. We are OWCH, a group of women over fifty who have created our own community in a new, purpose-built block of flats in North London. As an alternative to living alone, we have friendly, helpful neighbours. Students intending to embark on cohousing dissertations should be alert to the high volume of such requests we receive that we find it impossible to meet. We have tried to make this website as helpful as possible, so please make use of it. Would-be cohousing groups, please see sections on OWCH History; Resources. If you have further queries, do get in touch as we are very ready to share any lessons we have learned. We are carving out a path for others in our age group to follow. We hope they have an easier journey than ours, now we have shown the way. 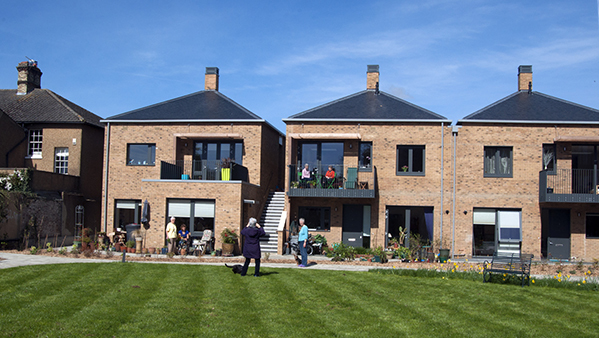 The senior cohousing community could enrich the last years of many, and reduce pressures on health and care services, if local authorities, planners, policy makers and housing developers helped to remove the many obstacles society puts in its way.